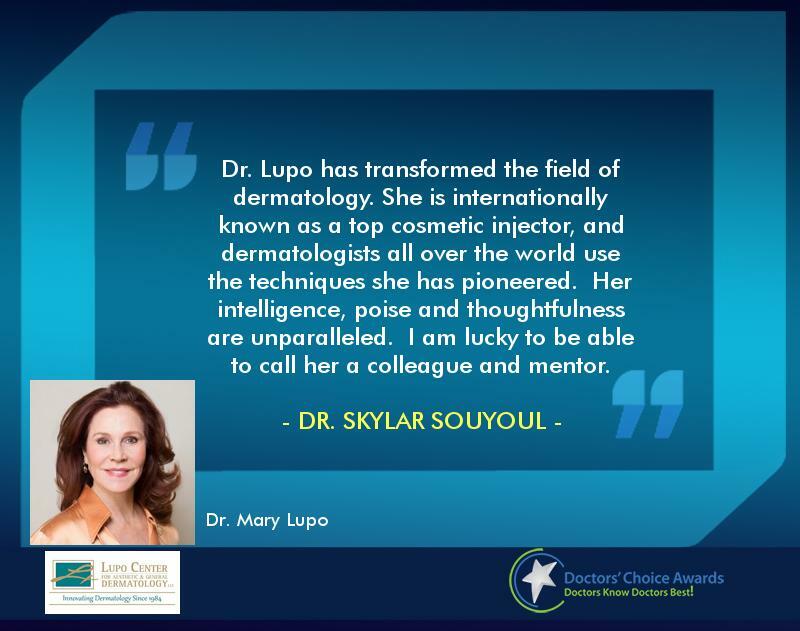 Services Offered: Cosmetic Dermatology, Medical Dermatology, Laser Dermatology Dr. Lupo is an award-winning, board-certified dermatologist who specializes in rejuvenating skin without surgery. She received the Peterkin Award for her work and has performed clinical trials and served as an FDA investigator for new treatments. 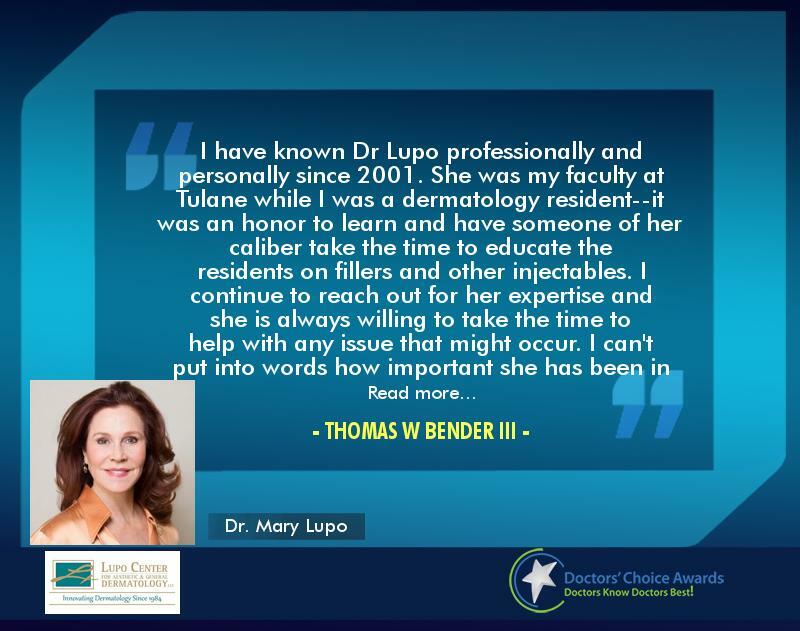 Dr. Lupo has been a committee member, founding member and even president of numerous medical boards in her field and is certified to practice in multiple states. She is clinical professor of dermatology at Tulane University School of Medicine, where she is also the director of the Resident Cosmetic Clinic. Doctors’ Choice Awards – Reviews for Dr. Mary Lupo! I feel so lucky to be able to call Dr. Lupo a mentor. She is dedicated to furthering our specialty in by graciously giving her time to give lectures and opening her office to visitors to teach us the latest techniques in injectables and aesthetics. She does this all and provides excellent patient care to both her medical and aesthetic patients. 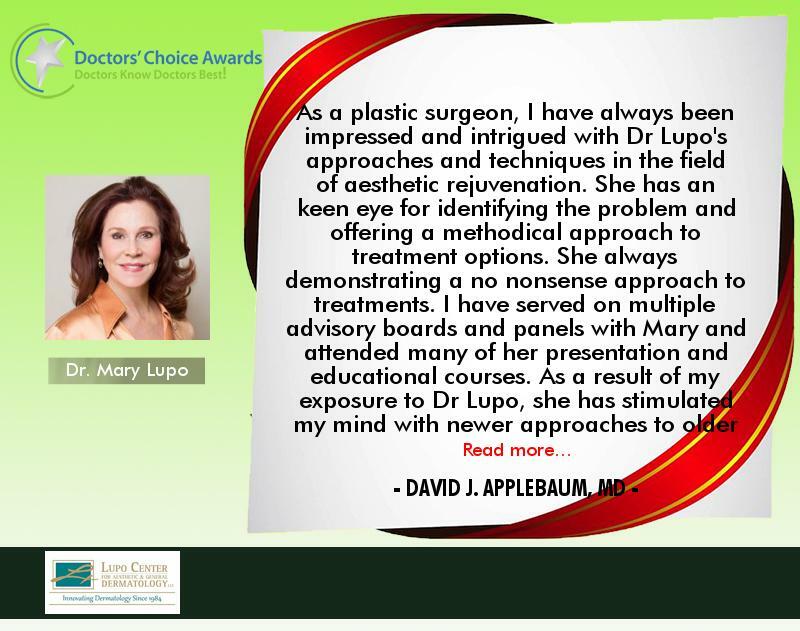 Dr. Lupo is an innovator in our specialty and we are so grateful for all that she does. 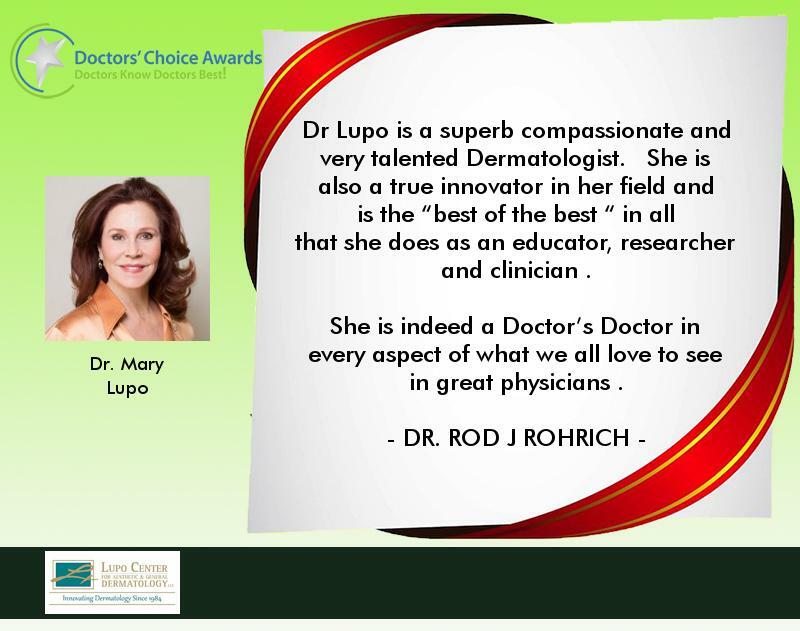 Dr Lupo is a superb compassionate and very talented Dermatologist. She is also a true innovator in her field and is the “best of the best “ in all that she does as an educator, researcher and clinician . She is indeed a Doctor’s Doctor in every aspect of what we all love to see in great physicians . 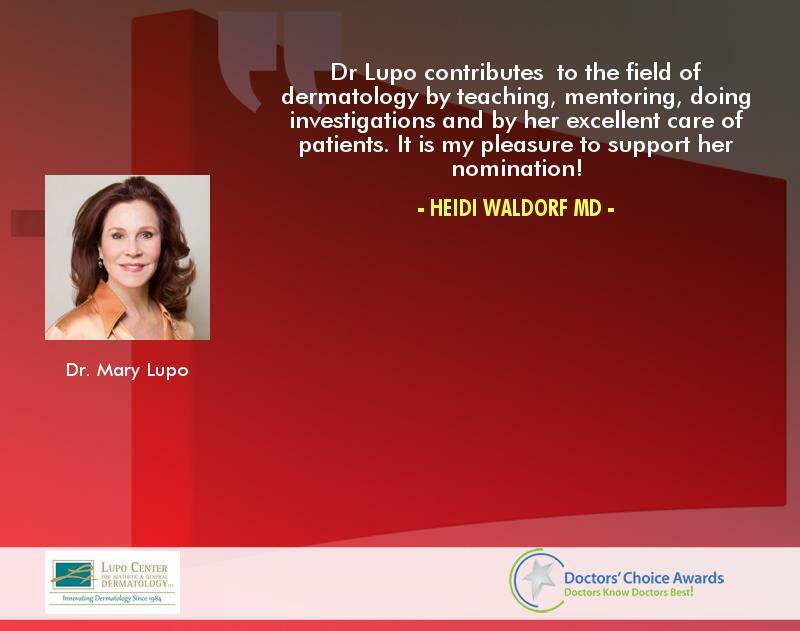 Dr. Mary Lupo is a dedicated leader and teacher/mentor in Cosmetic Dermatology. I have admired her teaching presentations at international cosmetic dermatology forums and meetings and always presents practical and useful tips for the practicing physician to apply immediately to our practices. Very down to earth and makes her patients feel welcomed and listened to in every clinical encounter. Dr. Lupo has transformed the field of dermatology. She is internationally known as a top cosmetic injector, and dermatologists all over the world use the techniques she has pioneered. Her intelligence, poise and thoughtfulness are unparalleled. I am lucky to be able to call her a colleague and mentor. 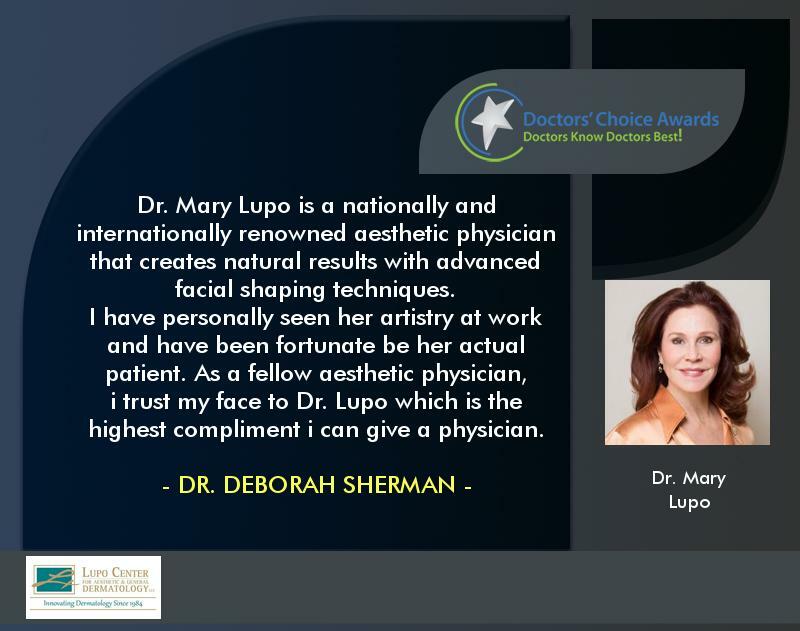 Dr. Mary Lupo is a nationally and internationally renowned aesthetic physician that creates natural results with advanced facial shaping techniques. I have personally seen her artistry at work and have been fortunate be her actual patient. 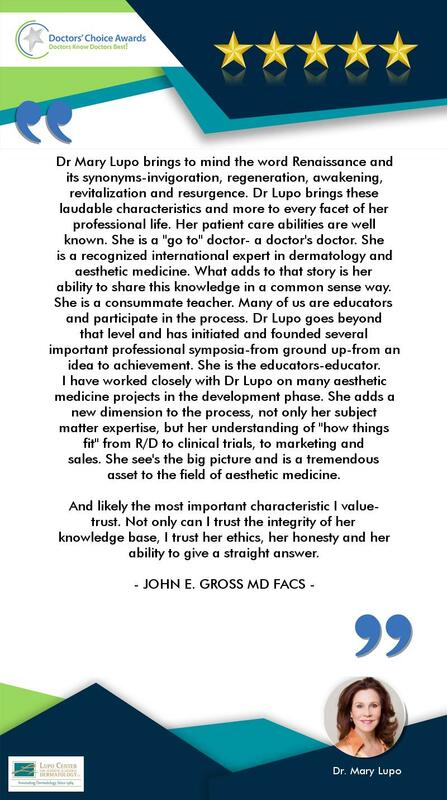 As a fellow aesthetic physician, i trust my face to Dr. Lupo which is the highest compliment i can give a physician. 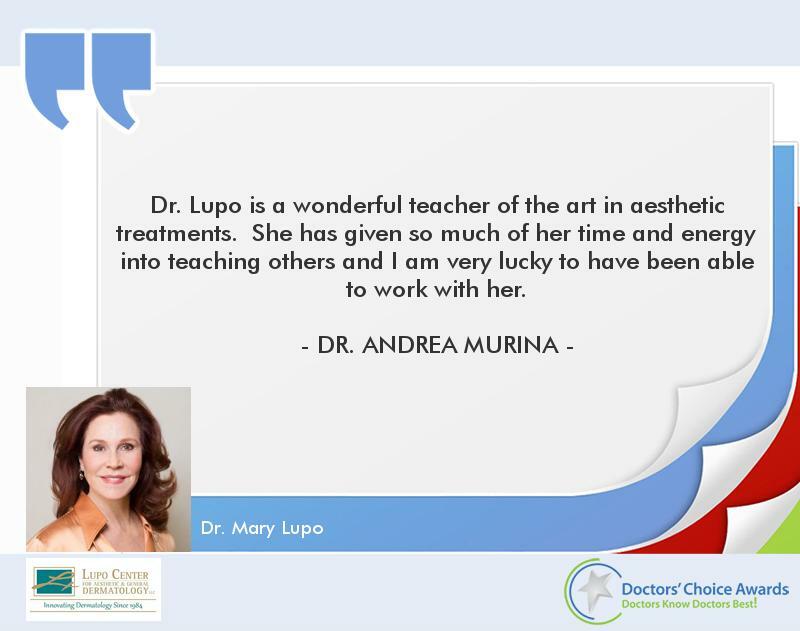 Dr. Lupo is a wonderful teacher of the art in aesthetic treatments. She has given so much of her time and energy into teaching others and I am very lucky to have been able to work with her. I have known Mary for many years. 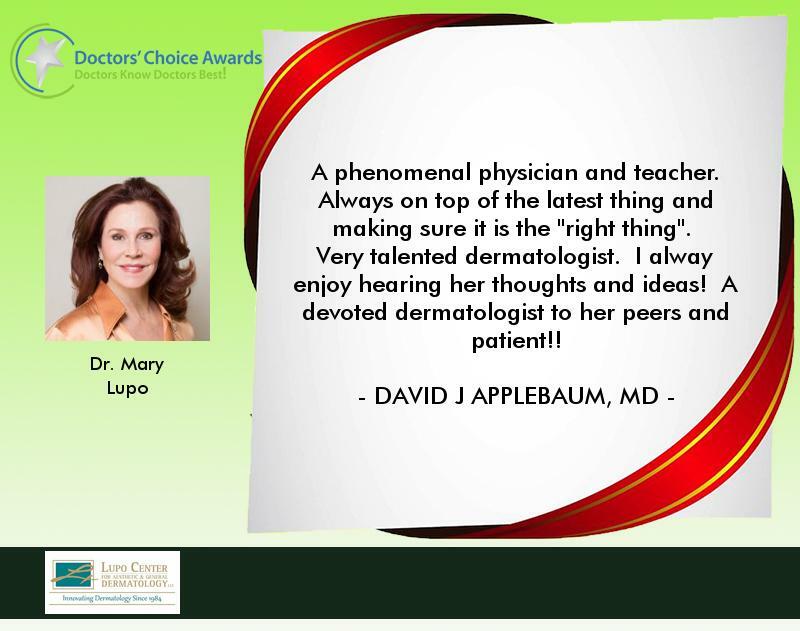 She is an outstanding dermatologist who has brought much to our specialty with her incredible teaching and personal skills as a compassionate and deeply caring clinician. She is well deserved to receive this award. 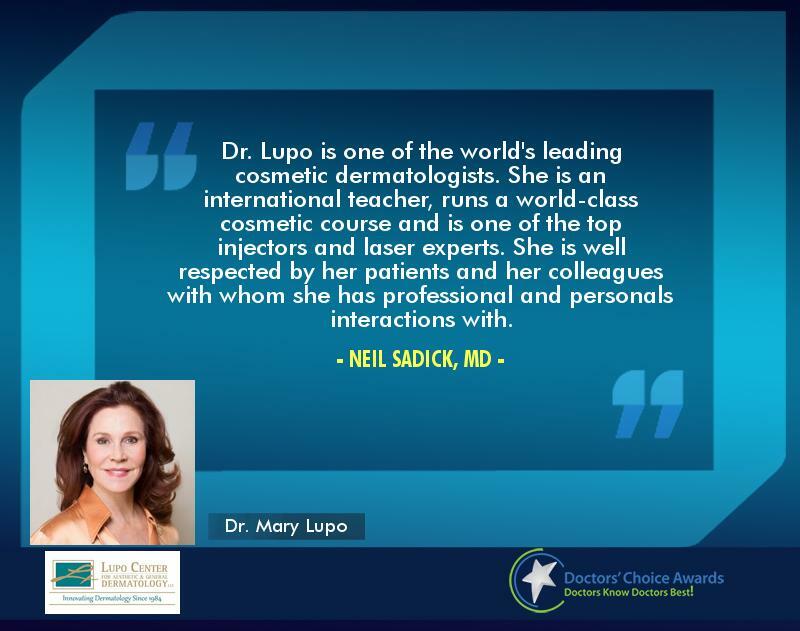 Dr. Lupo has been a world-renowned dermatologist for many years. She has helped advance and shape the field in profound ways. In addition, she is a very warm, compassionate lady always ready to help and mentor other young dermatologists. She has touched the lives of many. She has high ethical standards and delivers outstanding patient care. I cannot recommend her highly enough! 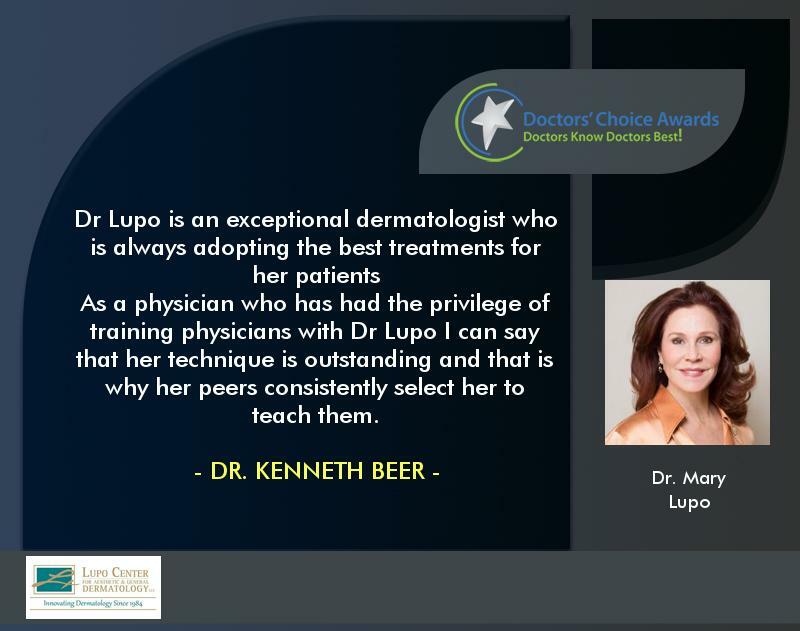 Dr Lupo is an exceptional dermatologist who is always adopting the best treatments for her patients As a physician who has had the privilege of training physicians with Dr Lupo I can say that her technique is outstanding and that is why her peers consistently select her to teach them. 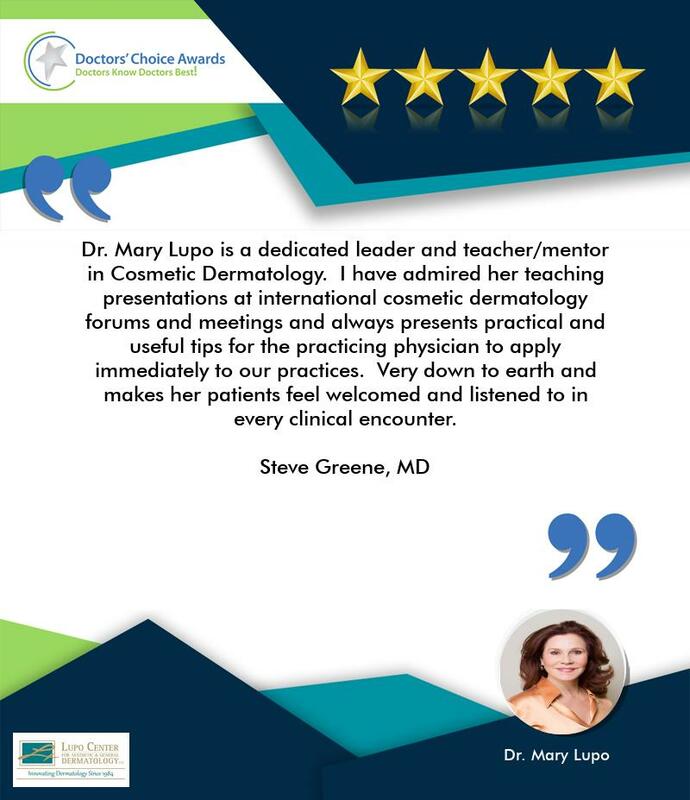 Dr. Mary Lupo is an excellent clinician, and insightful and amazing cosmetic dermatologist who makes her patients look very natural and enhances the quality of the skin as well as their overall self-esteem. She is a highly published author who has published countless scientific papers. She lectures nationally and internationally and is a top-tier Clinical Researcher and consultant for the larger pharmaceutical companies. Mary is a key opinion leader and I look up to her. 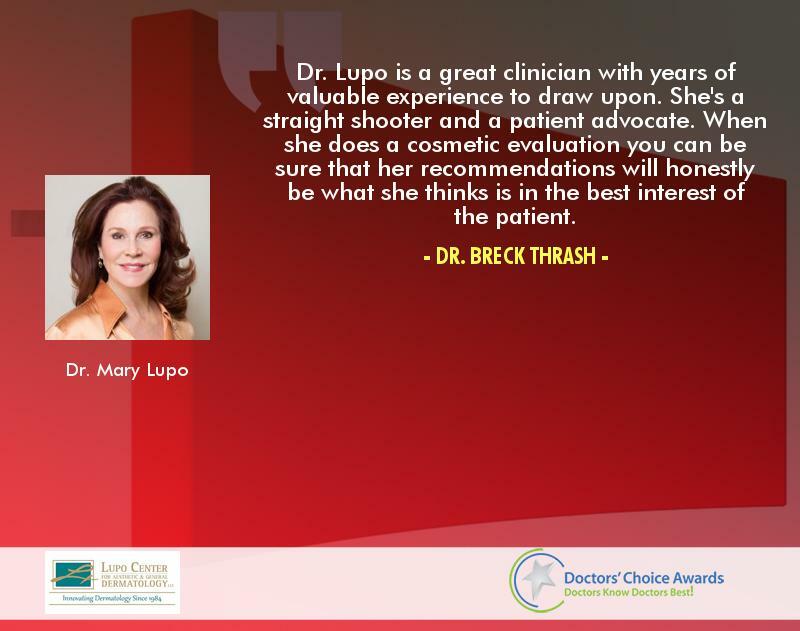 Dr. Lupo is a very devoted doctor whose patients love and trust her! She is very committed to her patients to look and feel their best. She has also been a teacher to many young dermatologists who have gone on to become leaders themselves, a tribute to her exemplary mentoring. Dr Mary Lupo is an outstanding aesthetic dermatologist, colleague, teacher and mentor. She is actively involved in our dermatology societies and is a pioneer in our field. 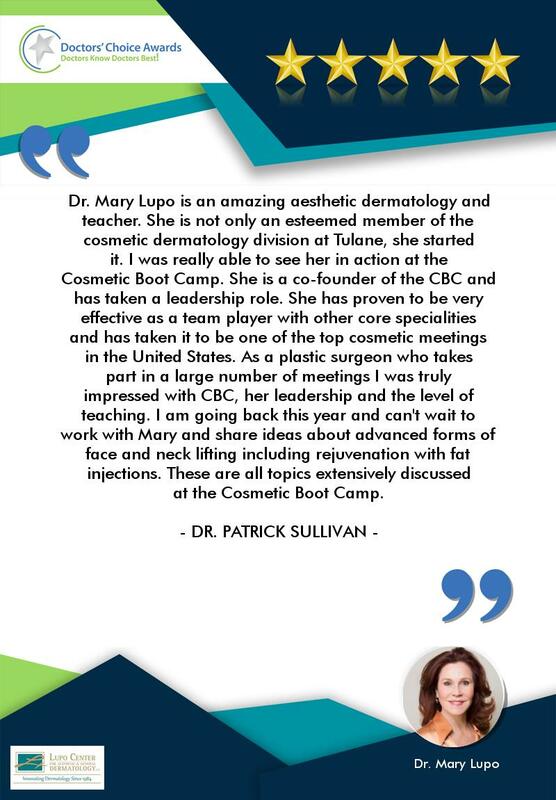 I first met Dr. Mary Lupo several years ago when I was an attendee at my first Cosmetic Bootcamp. At the time, as an Oculoplastic Surgeon, my core training was on Functional and Cosmetic surgery around the delicate Periocular zone and Upper face. She taught me to think outside the box and to be practical without compromising quality. Since then, my outlook on Facial Rejuvenation changed forever into a more comprehensive and integrative approach. 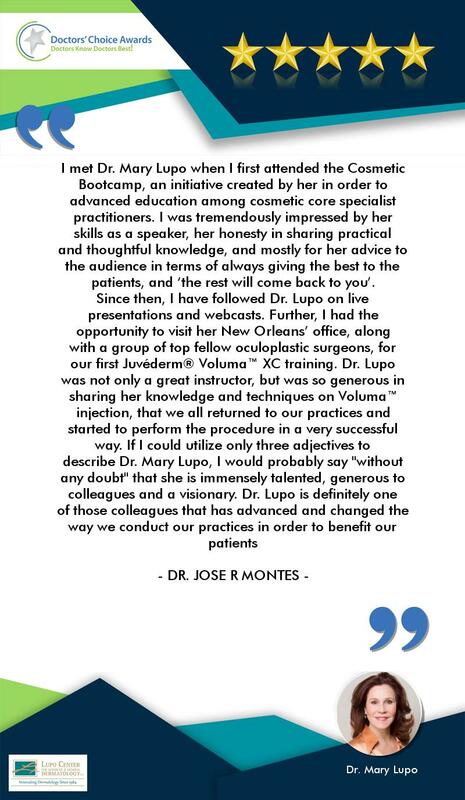 I appreciate Dr. Lupo not only a mentor but also as an inspiration to always pursue excellence while treating patients and when teaching students or colleagues. 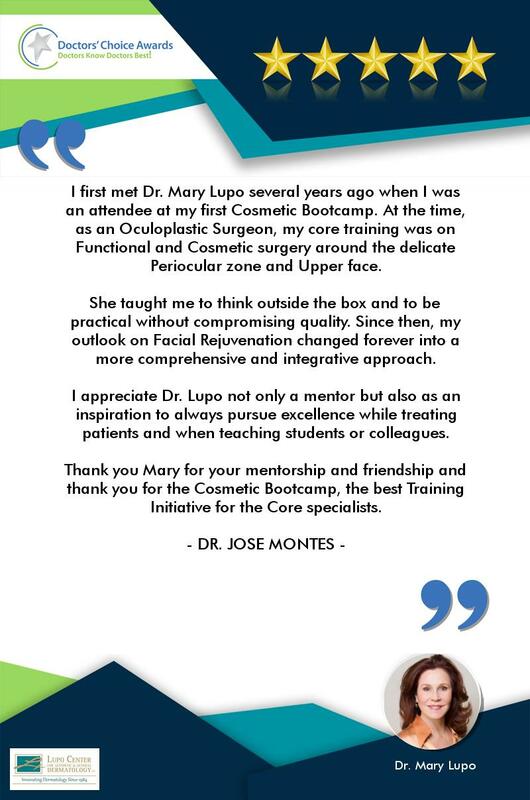 Thank you Mary for your mentorship and friendship and thank you for the Cosmetic Bootcamp, the best Training Initiative for the Core specialists. 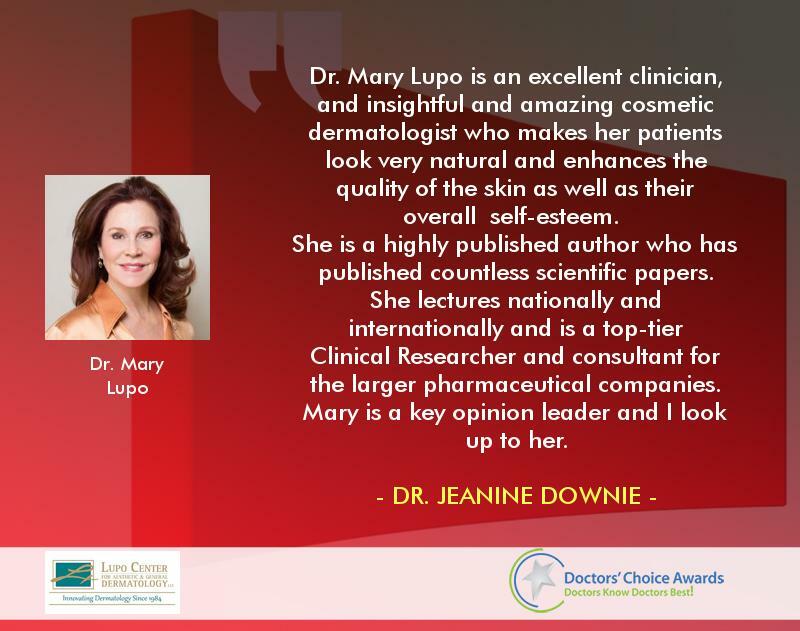 Dr Mary Lupo is a world leader in the field of cosmetic dermatology. I had the privilege to spend a two-week observership with Dr Lupo during my dermatology training and it was one of the most valuable learning experiences of my career. She is an amazing clinician and teacher and has fantastic relationships with all of her patients. She has continued to be a mentor to me in the field of cosmetic dermatology since I started my own dermatology practice. Dr. Lupo is the consummate professional. 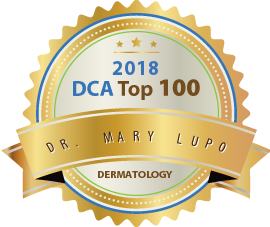 She is very knowledgeable about Aesthetic Dermatology and is a key opinion leader who has trained many of the prominent Dermatologists in this Country. Her cosmetic outcomes are excellent. She is thoughtful about her patients budget and gives real value to her patients. So for these reasons Dr. Lupo deserves to be a Top Doctor. A phenomenal physician and teacher. Always on top of the latest thing and making sure it is the \\\”right thing\\\”. Very talented dermatologist. I alway enjoy hearing her thoughts and ideas! A devoted dermatologist to her peers and patient!! Dr Lupo is one of the most knwoledgeble persons i have known, very passionate and eager to teach. I admire her and trust her as one of the top physicians in the field. Does it get any better? No, it does not. 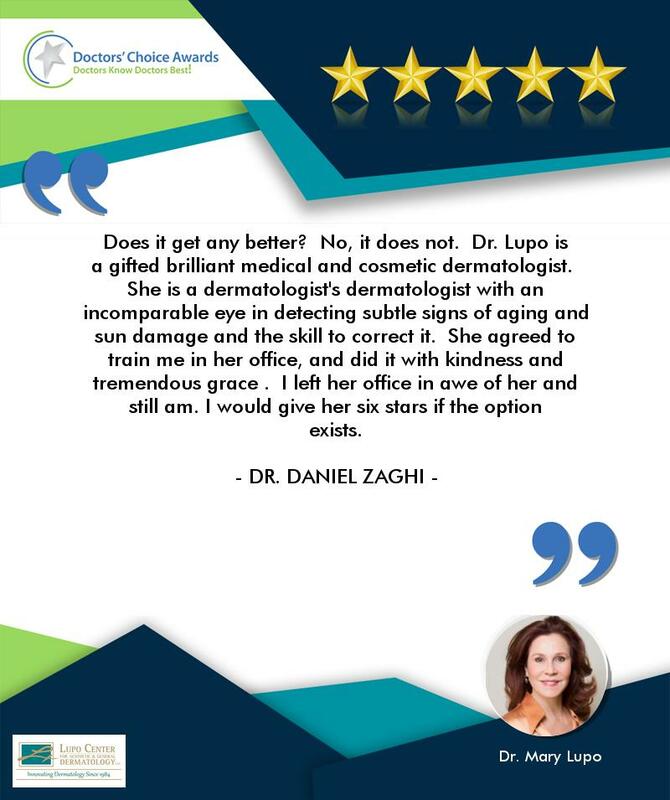 Dr. Lupo is a gifted brilliant medical and cosmetic dermatologist. She is a dermatologist’s dermatologist with an incomparable eye in detecting subtle signs of aging and sun damage and the skill to correct it. She agreed to train me in her office, and did it with kindness and tremendous grace . I left her office in awe of her and still am. I would give her six stars if the option exists. Dr Lupo is highly experienced and knowledgeable in general and cosmetic Dermatology, along with dermatological procedures. Dr Lupo is very approachable to both colleagues and patients, and always professional. 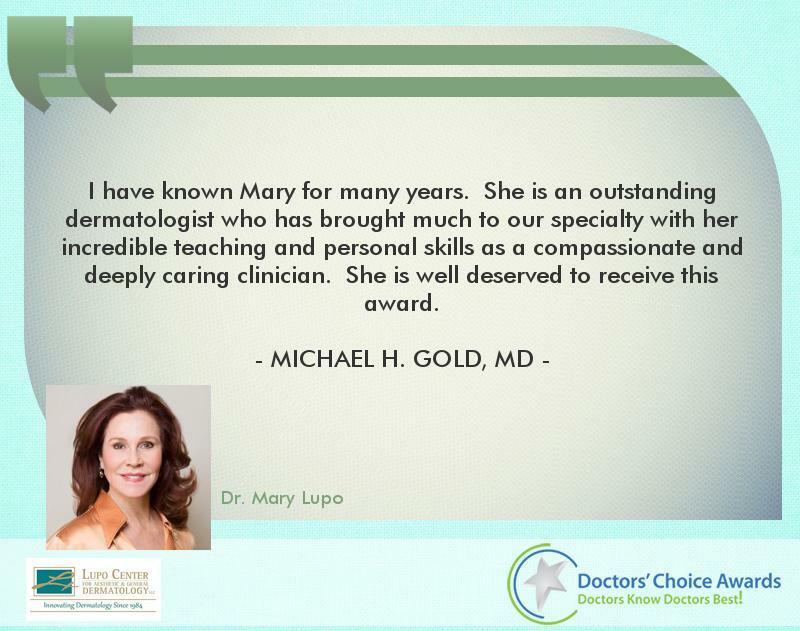 Dr Mary Lupo is an absolute wonderful dermatologist and person. She has mentored countless dermatologists around the country and her teaching/lecturing has touched countless others. If anyone deserves this honor it is definitely her. I am so honored to know her. Dr. Lupo is one of the best dermatologists i know, hand down. smart, personable, cutting-edge. nothing bad can be said about this wonderful woman. Dr. Emer. Dr Lupo contributes to the field of dermatology by teaching, mentoring, doing investigations and by her excellent care of patients. It is my pleasure to support her nomination! 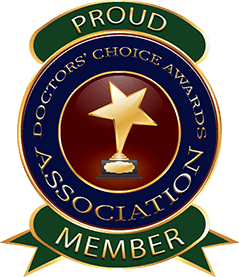 Dr Lupo is one of the most genuine, caring, skilled, and innovative physicians in this field. She lectures around the world, becoming an inspiration to dermatologists, as she educates with a “real world” approach. 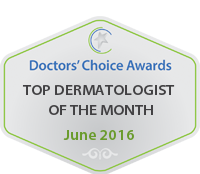 She also dedicates her time to so many dermatologists and was recently named Mentor of the Year. Not only is she a fabulous dermatologist, she is such an authentic and warm person, always taking her time to lend an ear or give thoughtful words of support. I am so honored to call her mentor, colleague, and friend. She definitely deserves this honor. A true leader in the field of Dermatology. An expert resource for all things dermatology products,procedures and equipment. 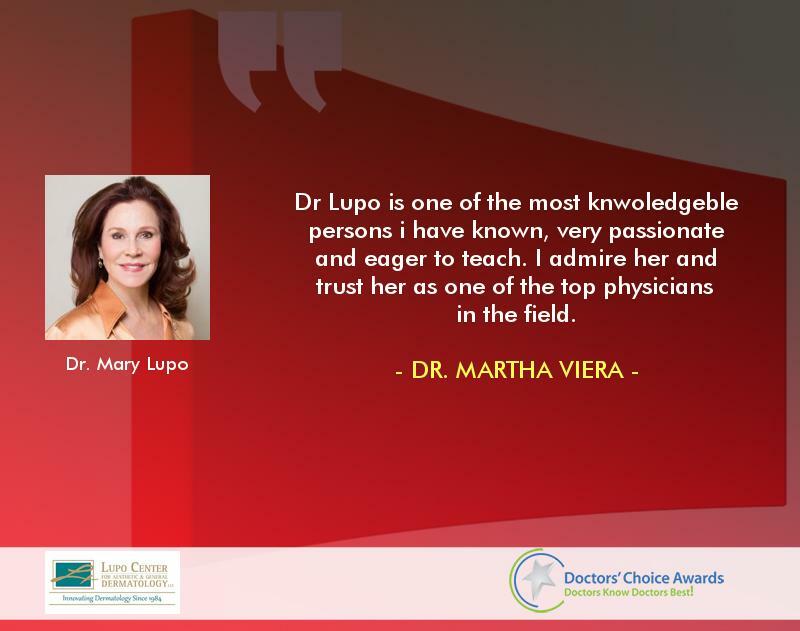 Dr. Lupo is one of the most outstanding physicians her field. Dr Lupo is an amazing clinician and role model. As my mentor when I was a resident at Tulane, she taught me how to practice dermatology effectively. She is a pioneer in the realm of cosmetic dermatology. I travel to New Orleans annually to see her. Her expertise is unrivaled and her bedside manner is admirable. I trust no other with my skin. 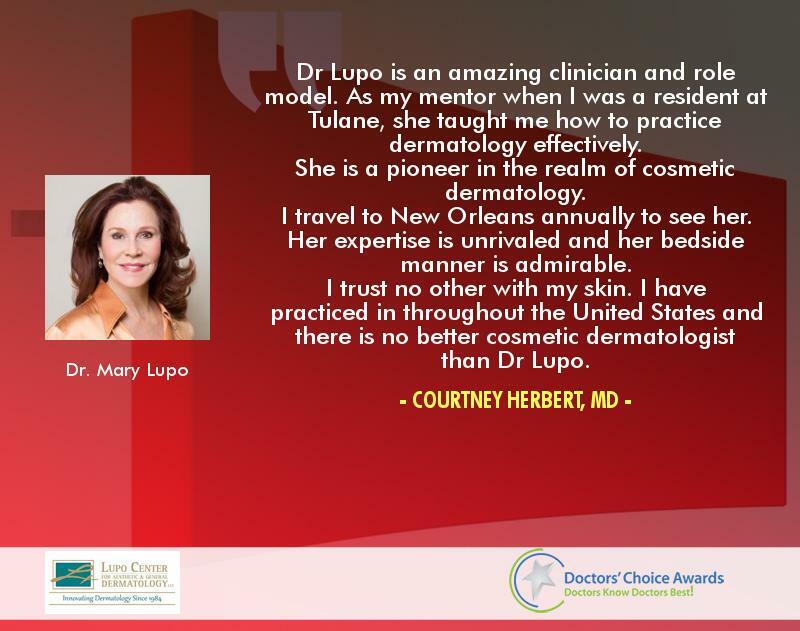 I have practiced in throughout the United States and there is no better cosmetic dermatologist than Dr Lupo. 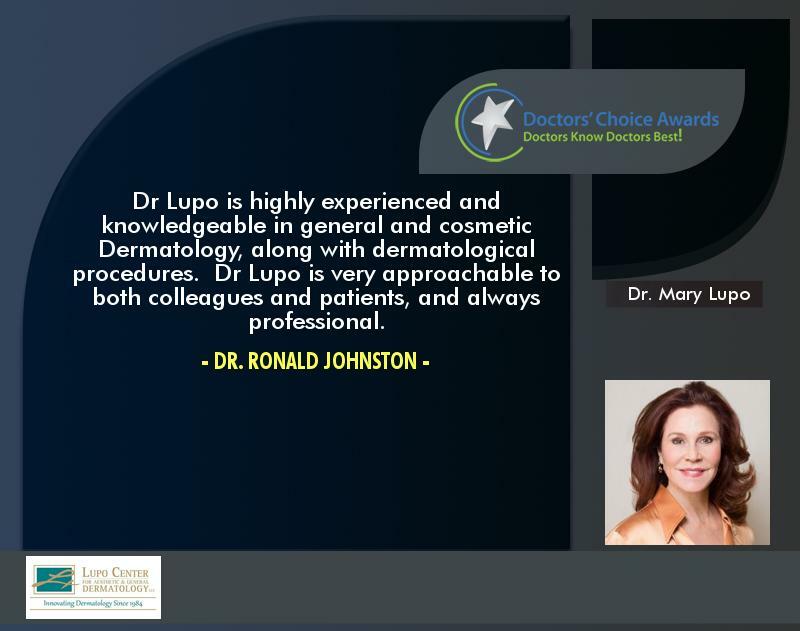 There is no question that Dr. Lupo is an expert at cosmetic dermatology. Not only are Dr. Lupo’s technical skills fantastic, but also her bedside manor and treatment philosophy are extraordinary. The ease at which she uses fillers and neurotoxins reflects her experience and deep understanding of each product. She selects products carefully – taking into account all aspects of the patient’s goals. She can do more with one syringe than anyone I have seen inject. In this way, she maximizes the outcome while minimizing cost to her patients. Dr. Lupo will set realistic expectations and focus on educating her patients. 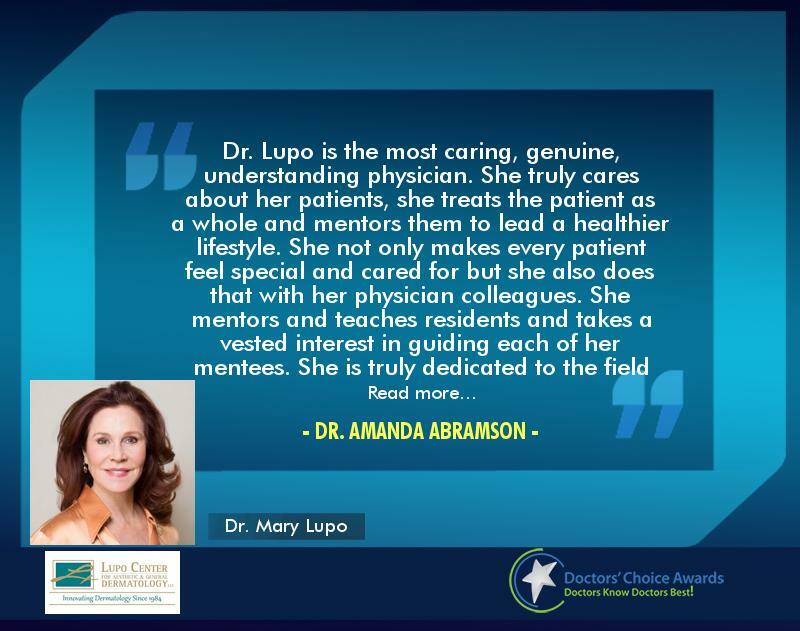 My time working with Dr. Mary Lupo during my final year of residency was unparalleled. I can genuinely say that I have learned more about cosmetic dermatology in two weeks with her than the rest of my residency thus far. Dr. Mary Lupo is an amazing aesthetic dermatology and teacher. She is not only an esteemed member of the cosmetic dermatology division at Tulane, she started it. I was really able to see her in action at the Cosmetic Boot Camp. She is a co-founder of the CBC and has taken a leadership role. She has proven to be very effective as a team player with other core specialities and has taken it to be one of the top cosmetic meetings in the United States. As a plastic surgeon who takes part in a large number of meetings I was truly impressed with CBC, her leadership and the level of teaching. I am going back this year and can’t wait to work with Mary and share ideas about advanced forms of face and neck lifting including rejuvenation with fat injections. These are all topics extensively discussed at the Cosmetic Boot Camp. 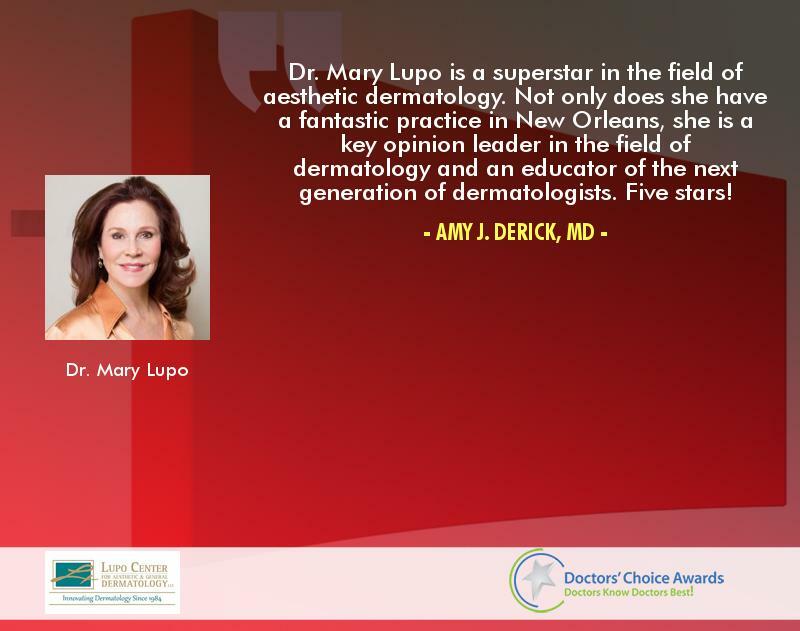 Dr. Mary Lupo is a trailblazer in the aesthetic dermatology arena. She started the cosmetic dermatology division at Tulane and co-founded one of the top cosmetic dermatology meetings in the US, Cosmetic Boot Camp. This meeting trains hundreds of physicians annually. She is truly a leader in dermatology, demonstrated by several accomplishments – American Society of Dermatologic Society Board of Directors, past president of the Women’s Dermatologic Society (WDS) and recently receiving the WDS’s Mentor of the Year Award, among many others. I will be candid and to the point. I have worked with over a dozen cosmetic dermatologists and in multiple cities across the country. Dr. Lupo exceeds them all. She has everything you could ask for. Wicked smarts. An artist’s keen eye for facial rejuvenation. A genuine care and love of her patients. Unshakable integrity and honesty. And, most importantly, a litany of pioneering techniques to aesthetic dermatology. Like all gurus, she makes it seem easy, though it is anything but. 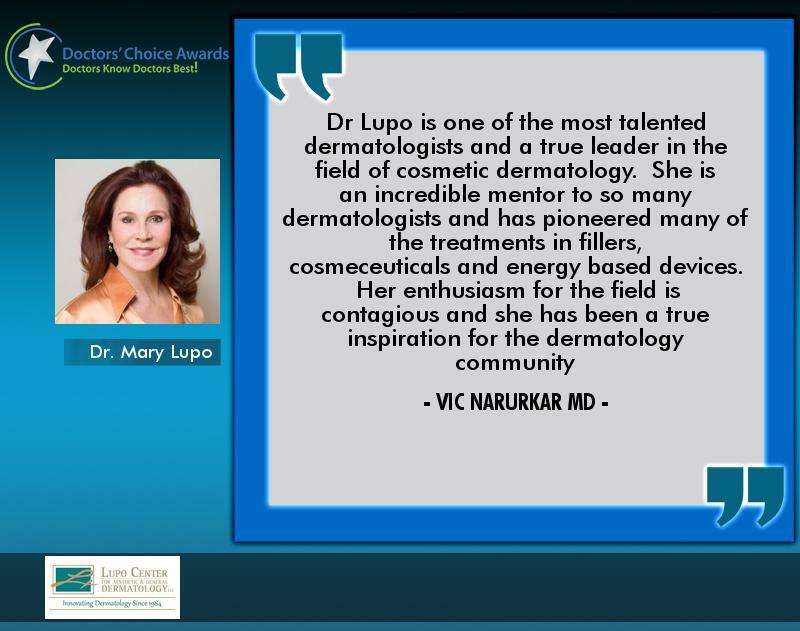 In addition and often unacknowledged is Dr. Lupo’s generous mentorship of many young aspiring dermatologists. She is my mentor and I feel confident going to her with questions and advise in the future. She has many grateful mentees she has taken under her wing. Whether you are a patient or another dermatologist looking to learn aesthetic dermatology, it simply does not get better than Dr. Lupo. Dr. Lupo is a great clinician with years of valuable experience to draw upon. She’s a straight shooter and a patient advocate. When she does a cosmetic evaluation you can be sure that her recommendations will honestly be what she thinks is in the best interest of the patient. 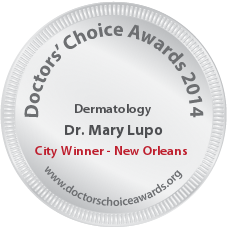 Dr. Lupo is one of the world’s leading cosmetic dermatologists. She is an international teacher, runs a world-class cosmetic course and is one of the top injectors and laser experts. She is well respected by her patients and her colleagues with whom she has professional and personals interactions with. Dr Lupo is an innovator and leader is the field of aesthetic dermatology. Dr Mary Lupo brings to mind the word Renaissance and its synonyms-invigoration, regeneration, awakening, revitalization and resurgence. 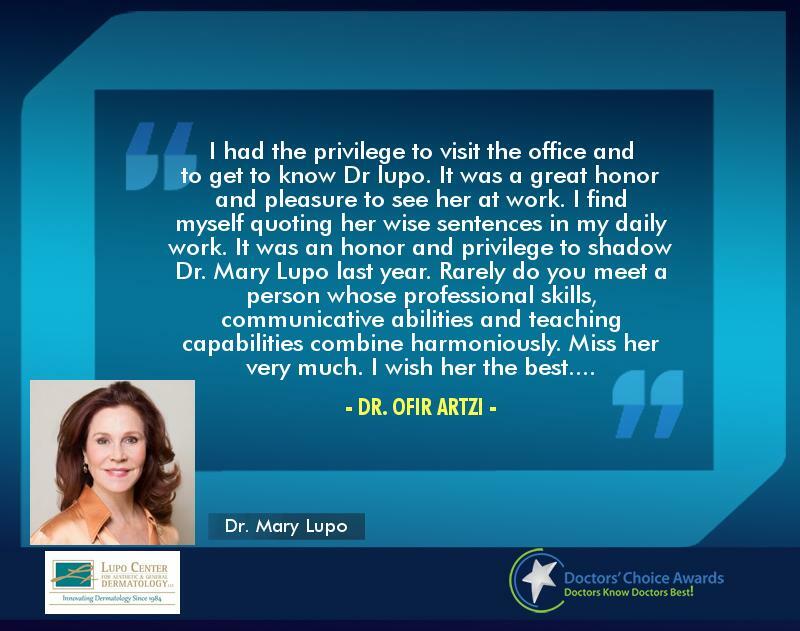 Dr Lupo brings these laudable characteristics and more to every facet of her professional life. Her patient care abilities are well known. She is a “go to” doctor- a doctor’s doctor. She is a recognized international expert in dermatology and aesthetic medicine. What adds to that story is her ability to share this knowledge in a common sense way. She is a consummate teacher. Many of us are educators and participate in the process. Dr Lupo goes beyond that level and has initiated and founded several important professional symposia-from ground up-from an idea to achievement. She is the educators-educator. I have worked closely with Dr Lupo on many aesthetic medicine projects in the development phase. She adds a new dimension to the process, not only her subject matter expertise, but her understanding of “how things fit” from R/D to clinical trials, to marketing and sales. She see’s the big picture and is a tremendous asset to the field of aesthetic medicine. And likely the most important characteristic I value- trust. Not only can I trust the integrity of her knowledge base, I trust her ethics, her honesty and her ability to give a straight answer. As a plastic surgeon, I have always been impressed and intrigued with Dr Lupo’s approaches and techniques in the field of aesthetic rejuvenation. She has an keen eye for identifying the problem and offering a methodical approach to treatment options. She always demonstrating a no nonsense approach to treatments. I have served on multiple advisory boards and panels with Mary and attended many of her presentation and educational courses. 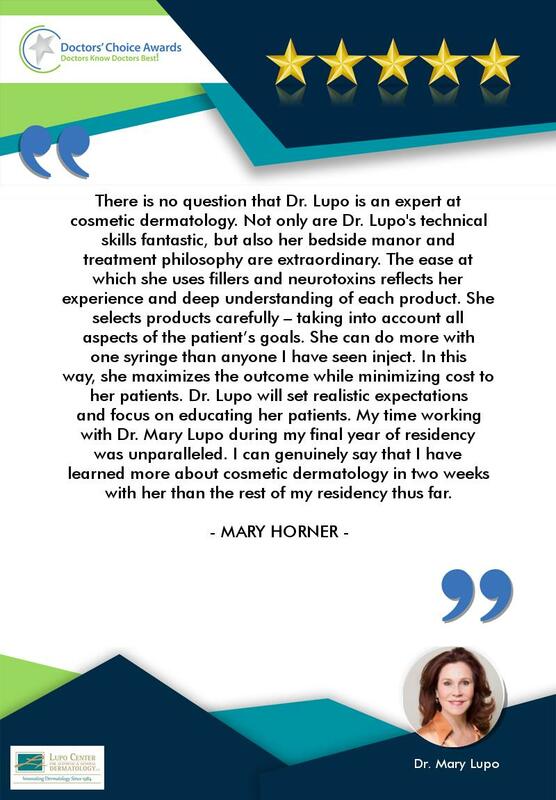 As a result of my exposure to Dr Lupo, she has stimulated my mind with newer approaches to older problems resulting in improving my treatment and care of patients! I consider Mary a mentor and a friend! I have known Dr Lupo professionally since 2000. She is an accomplished leader not only in academics, but also in organizational service. 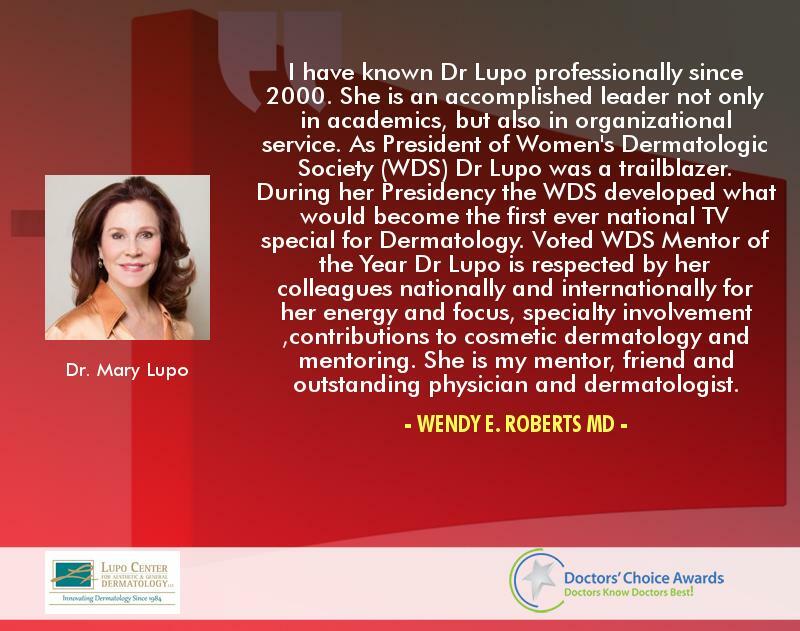 As President of Women’s Dermatologic Society (WDS) Dr Lupo was a trailblazer. During her Presidency the WDS developed what would become the first ever national TV special for Dermatology. Voted WDS Mentor of the Year Dr Lupo is respected by her colleagues nationally and internationally for her energy and focus, specialty involvement ,contributions to cosmetic dermatology and mentoring. She is my mentor, friend and outstanding physician and dermatologist. I have known Dr Lupo professionally and personally since 2001. She was my faculty at Tulane while I was a dermatology resident–it was an honor to learn and have someone of her caliber take the time to educate the residents on fillers and other injectables. I continue to reach out for her expertise and she is always willing to take the time to help with any issue that might occur. I can’t put into words how important she has been in the way I take care of patients and how fortunate I am to be able to have here as a mentor and friend. 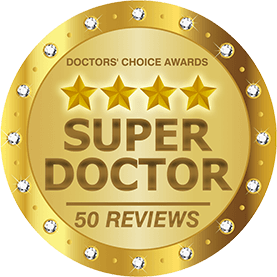 Dr Lupo is an excellent physician, who is skilled in medical, procedural and cosmetic dermatology. 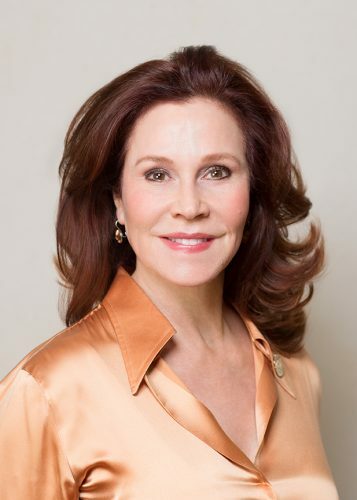 As one of the leaders in the field of dermatology, she is on the cutting edge of injectables and skin care. Dr. Lupo’s expertise is only matched by her compassion, patience and demand for high standards of patient care. She is sought after constantly to train and lecture providers from novice to experienced. 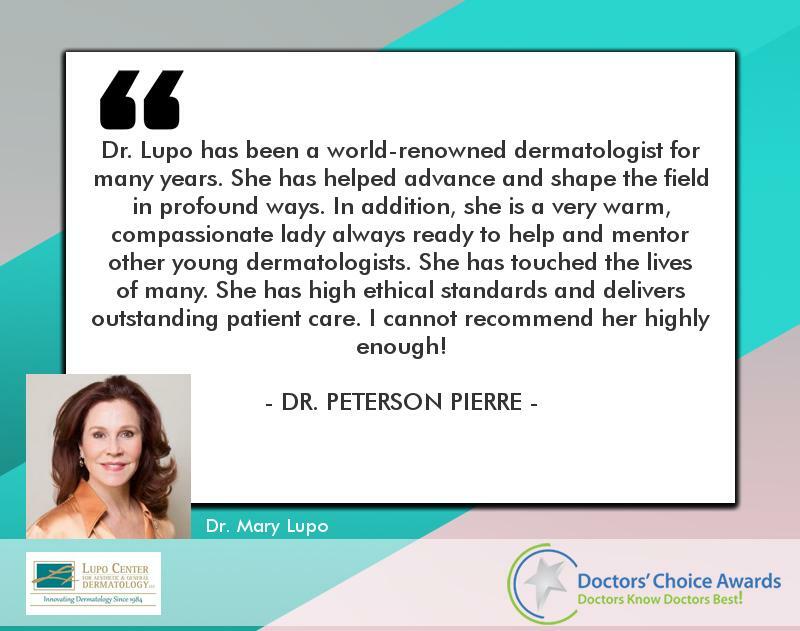 Her attention-to-detail and ability to diagnose skin conditions enable Dr Lupo to provide superb care to her patients. Dr. Lupo is an outstanding physician. She is an extremely skilled injector of fillers and has extensive experience with laser devices. She has mentored numerous colleagues and has even received the prestigious WDS membership award. She has been dedicated to research and participated in numerous clinical trial for new products. I have even had the privilege of being her patient myself. 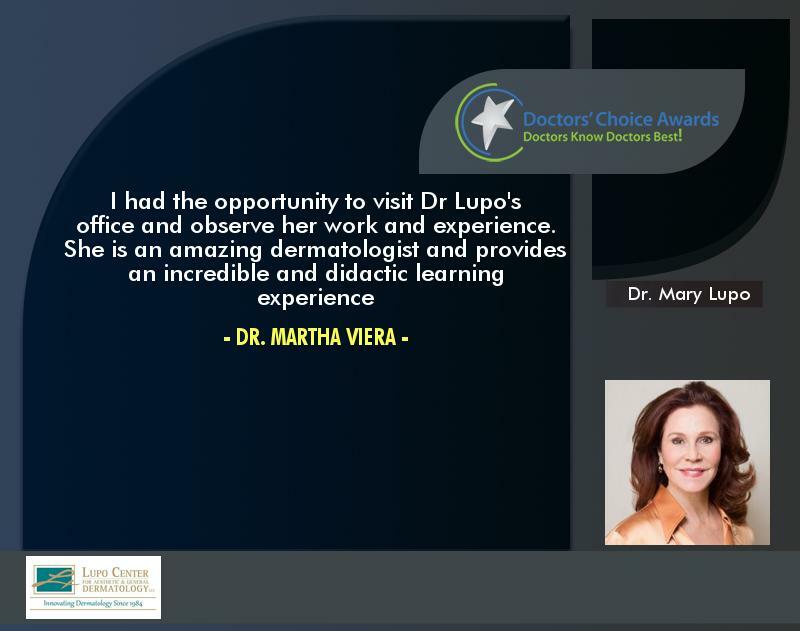 I had the privilege of visiting Dr. Mary Lupo’s practice and have served on panels with her at the American Academy of Dermatology. She has a phenomenal patient following as a result of excellent clinical skills and is a gifted dermatologic and cosmetic surgeon. She is a passionate teacher and opinion leader and does it all with a fabulous sense of humor. 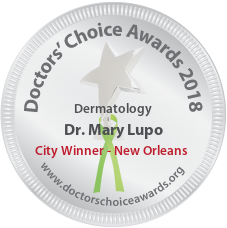 Dr. Mary Lupo is a wonderful and brilliant dermatologist who has mentored many over the years; she started the Cosmetic Dermatology Clinic at Tulane University School of Medicine in the 80’s, before we knew about cosmetic dermatology. Because of her knowledge and insight, she set the pathway for other Cosmetic Dermatology programs. Mary is one of the most energetic mentors that I have ever known: she has shared her expertise not only with the Tulane program, but also with the Women’s Derm Society(WDS) (where she was president and recently awarded Mentor of the Year), the American Academy of Dermatology(AAD), and Cosmetic Boot Camp(CBC) where she was one of the founders; she is internationally known and frequently travels the globe lecturing, mentoring, and sharing her innovative non surgical skin rejuvenation procedures. More recently, Dr. Lupo has become involved with Alphaeon where she is an expert and ambassador in the Teoxane line of topical anti agers and in Teoxsyl, the soon to be injectable available for various lines, folds and volume loss. Dr. Lupo is someone that I would go to (and do) and would recommend to my family to go to. I had the privilege to visit the office and to get to know Dr lupo. It was a great honor and pleasure to see her at work. I find myself quoting her wise sentences in my daily work. It was an honor and privilege to shadow Dr. Mary Lupo last year. Rarely do you meet a person whose professional skills, communicative abilities and teaching capabilities combine harmoniously. Miss her very much. I wish her the best…. I have known Dr. Mary Lupo for over twenty years. I don’t know were she finds the energy to continue to teach, both locally, and on a national level. Are you familiar with the term “energizer bunny?” I have benefitted from her teaching in the Tulane residency program and now, I continue to seek her valuable advice as a private practice dermatologist. She also gives great business/personal advice and has been known to be a good matchmaker for those who dare! Dr. Lupo is a leader in the field of dermatology. Her knowledge and expertise with various products and procedures makes her an excellent mentor. She dedicates a large amount of her time to the education of others in the medical field, which only speaks more towards her character. Mary Lupo, MD is a rock star in the world of dermatology. Her peers turn to her for advice and recommendations. Her talks are typical overfilled at our meetings. She is smart, incredibly capable, amazing teacher and so much fun to be around. 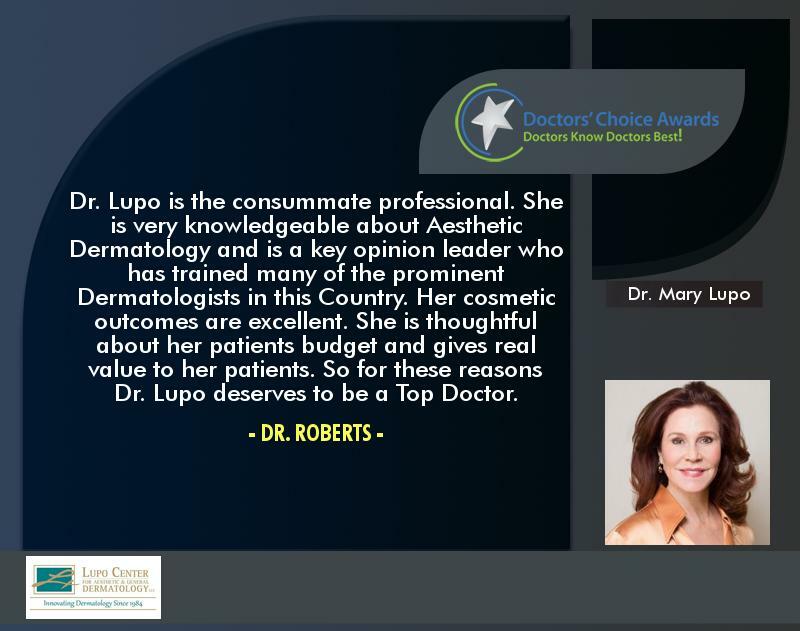 Dr. Mary Lupo is a superstar in the field of aesthetic dermatology. 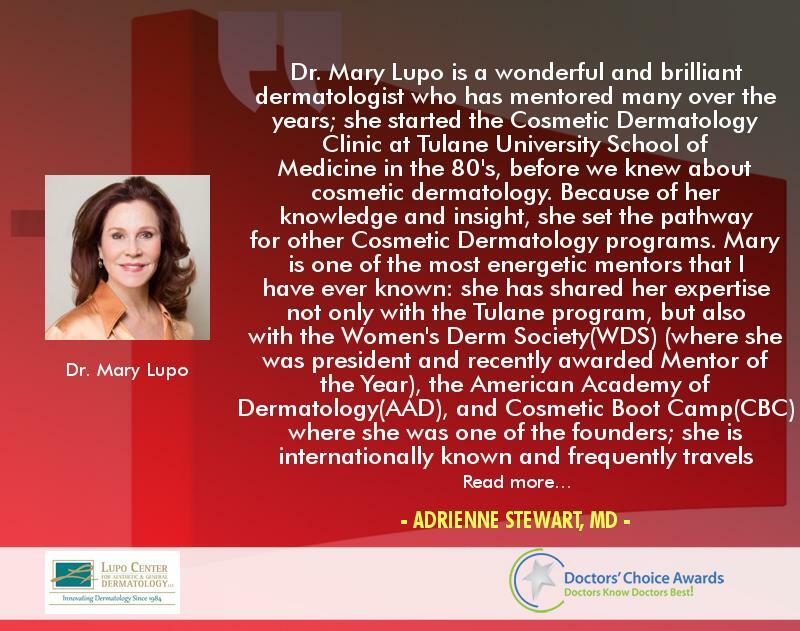 Not only does she have a fantastic practice in New Orleans, she is a key opinion leader in the field of dermatology and an educator of the next generation of dermatologists. Five stars! Dr. Lupo is the most caring, genuine, understanding physician. She truly cares about her patients, she treats the patient as a whole and mentors them to lead a healthier lifestyle. She not only makes every patient feel special and cared for but she also does that with her physician colleagues. She mentors and teaches residents and takes a vested interest in guiding each of her mentees. She is truly dedicated to the field of dermatology and works tirelessly to educate her fellow dermatologists and enhance the field. Dr.Lupo is a class act, a leader and is one of the best role models in the entire speciality of dermatology.